Strand anchors are similar to bar anchors except that they are made up of multiple high strength steel cable strands. Each strand is further constructed of up to seven individual steel wires. This construction method allows for the development of much higher loads utilizing the same or smaller sized drill holes than would be required of standard bar anchors. There is no theoretical limit to the load carrying capacity of strand anchors – additional capacity is created simply by increasing the number of 7-wire strands in the anchor. The Coastal Drilling East team of technicians, specialists and engineers work together to determine the best strand anchor solutions to fit a variety of applications. 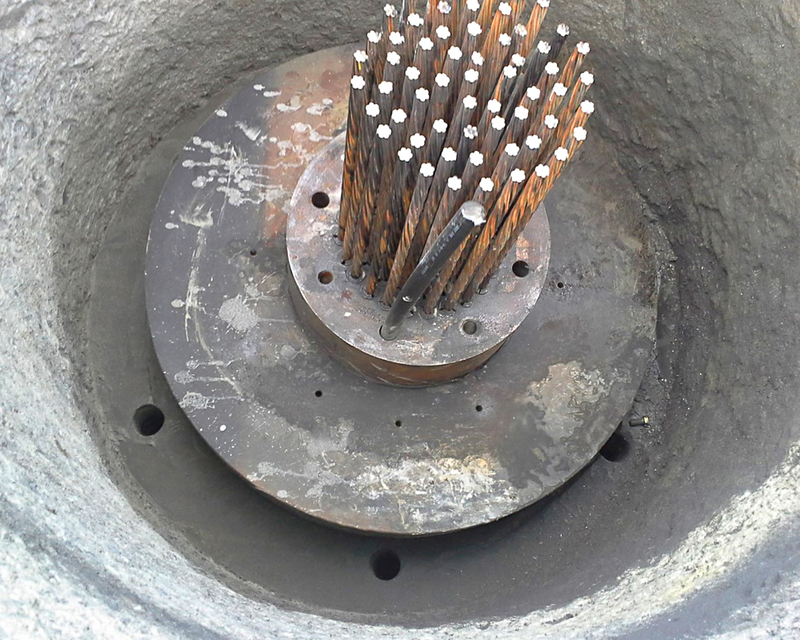 Our goal is to maximize the benefits of the strand anchor system chosen for the project. These solutions are similar to both types of bar anchors but are made with multiple high strength steel cable strands and offer a limitless load-bearing capacity. CDE has successfully installed some of the largest strand anchors in the United States at 61-strands and over 3 million pounds of ultimate capacity.